NIGHTWISH Vocalist Anette Olzon On Using Stand-In Vocalists For Denver Show - "I Was Never Asked If It Was Okay; I Don't Think It Was A Good Decision"
On Friday, September 28th NIGHTWISH took the stage at the Ogden Theatre in Denver, CO without vocalist Anette Olzon, who was hospitalized due to illness. Support act KAMELOT's backing vocalists Elize Ryd (AMARANTHE) and Alissa White-Gluz (THE AGONIST) stepped in to fill Olzon's role alongside bassist/male singer Marco Hietala. Olzon released a statement (found below) explaining the situation, and followed it up a day later with her take on having Elize and Alissa stepping-in for her. Thanks for your support! And you know, this is just music. Like life, sometimes we get ill and shows do get cancelled. Rihanna wouldn't ask Britney Spears to sing for her if she was ill. To think a show is more important than the humans in the band is for me, so totally not in this world." Olzon recently saw the Imaginaerum movie and issued the following comment: "I have seen the Imaginaerum movie for the very first time, people. And I can just say that I really liked it! I cried in the end (yeah, sensitive as I am) and it was just amazing to see it all finally finished." The soundtrack for Imaginaerum, will be released on November 9th. Imaginaerum By Nightwish: The Score features 13 grandiose, unreleased re-interpretations of Imaginaerum tracks by Petri Alanko. 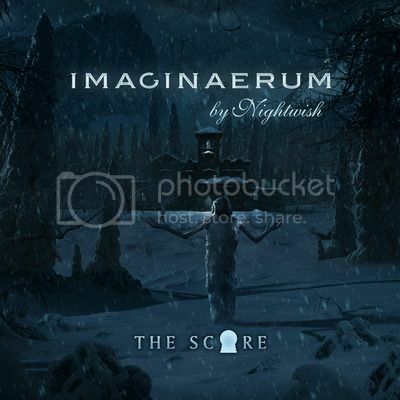 Imaginaerum By Nightwish: The Score is currently available for pre-order via the official Nightwish shop, found here. It will be available viaAmazon.com soon.